Different business organizations and individuals take rooms on lease or rent from the owners for specific purposes. 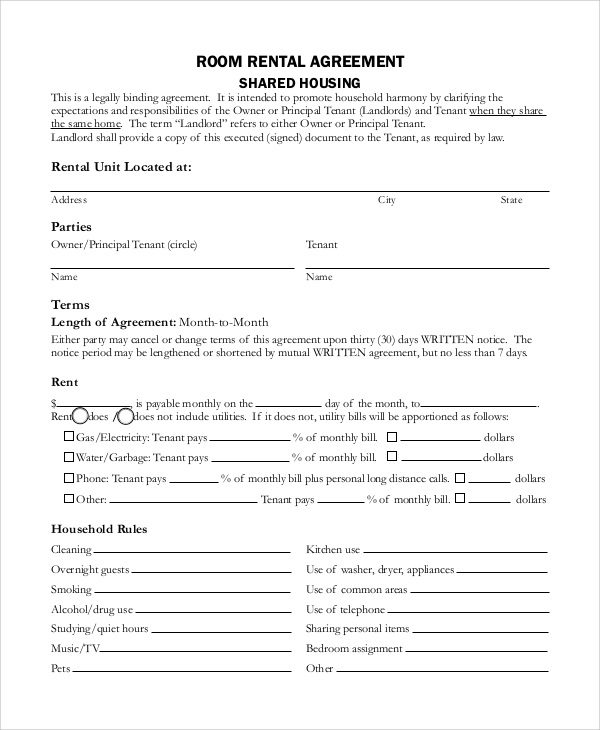 When you sign an agreement, you will require a Room Rental Agreement form to set the terms of the contract. These agreements contain all the terms signed upon by the two parties, including the duration of the contract, payment clauses and so on. 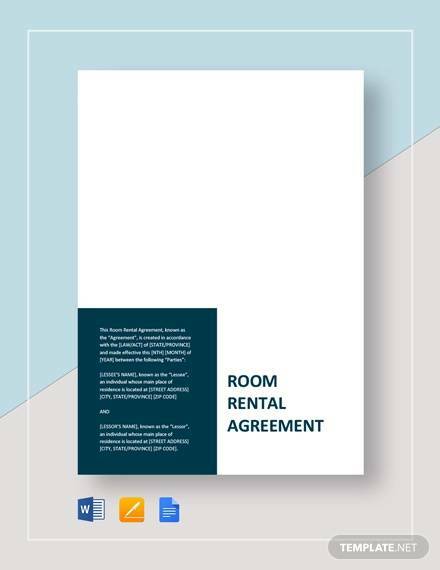 Here are some Sample Agreements for room rental for you to check out and you can get a conception about the format. This is a formal agreement form that contains the details of the two parties, terms of payment and a statement regarding the resolution of conflicts. A tabular format is used to present the clauses like the use of drugs and alcohol, keeping of pets and other details. 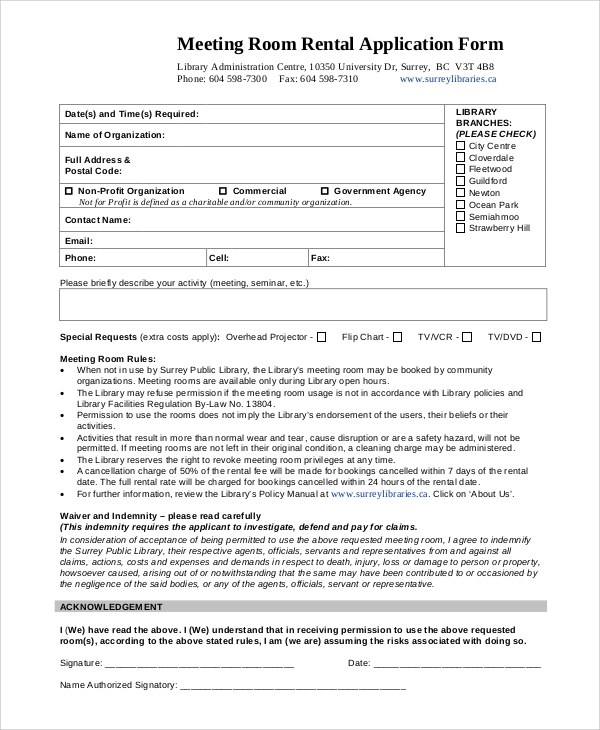 These forms may include relevant graphics and images. The details of the package like reservation clause related to vendors, lights, sitting arrangement and other details are included in the agreement. 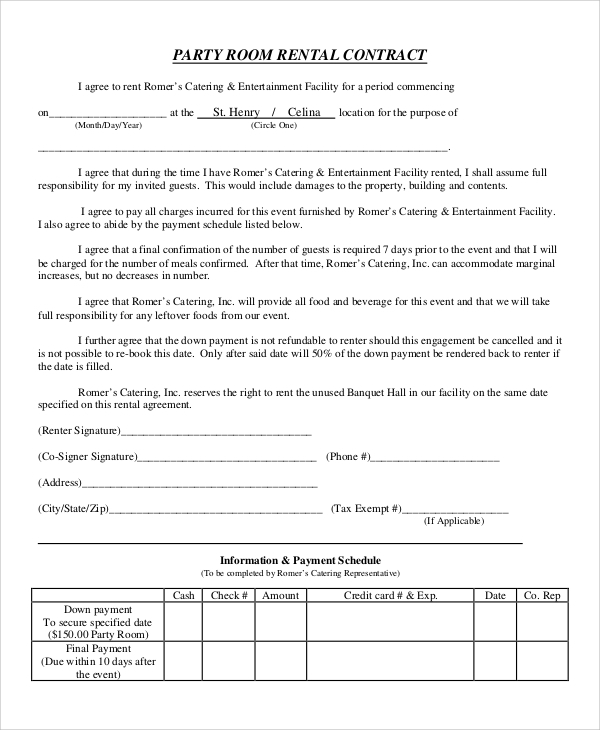 You may also see the Basic Rental Agreement Samples. 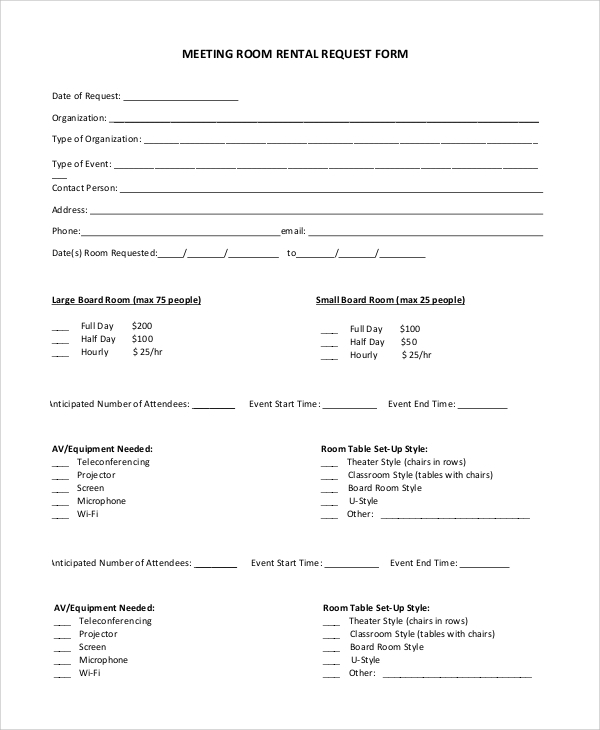 The name of the organization hiring the meeting room and its contact information are included in the first part of the template. Later the rules to be abided by in the hall are included in the form. Why is a Room Rental Agreement Important? A Room Rental Agreement serves as a legal document and requires both the parties to perform some duties. The relationship between a tenant and the owner rests on mutual trust and respect for the obligation. Thus, to prevent breaches of the agreed terms, these agreements are of utmost importance. It contains all the clauses, and both the parties are expected to stick to their obligation. For instance, the owner cannot terminate the contract before the agreed upon date. He also has to make the living conditions suitable for the tenant. On the other hand, the tenant has to maintain the cleanliness of the place and avoid damaging the property. 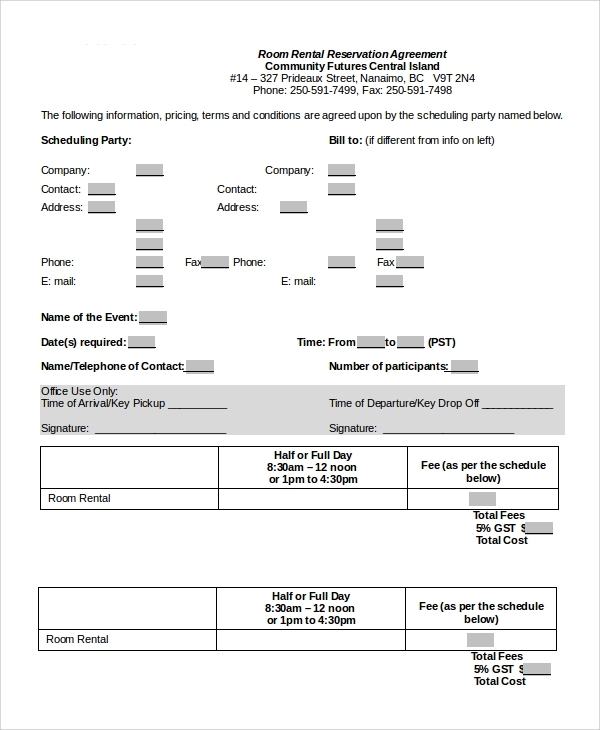 Here the names of the scheduling party and billing party and their contact information are included on the top. 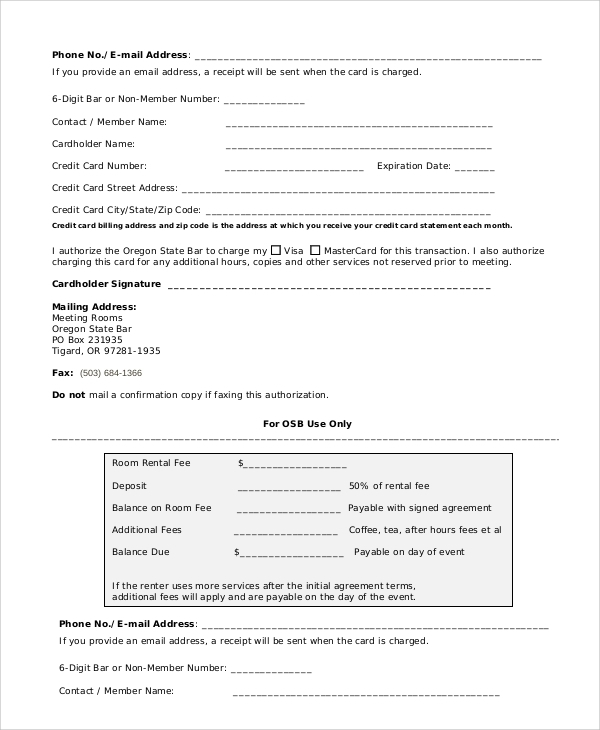 The rates of payment are presented in a tabular format. The document includes the exact timings and date of the event. The introductory sentence states the names of the two parties signing the agreement. The clauses of the agreement are listed up below this part, and it ends with the signature of both the parties. 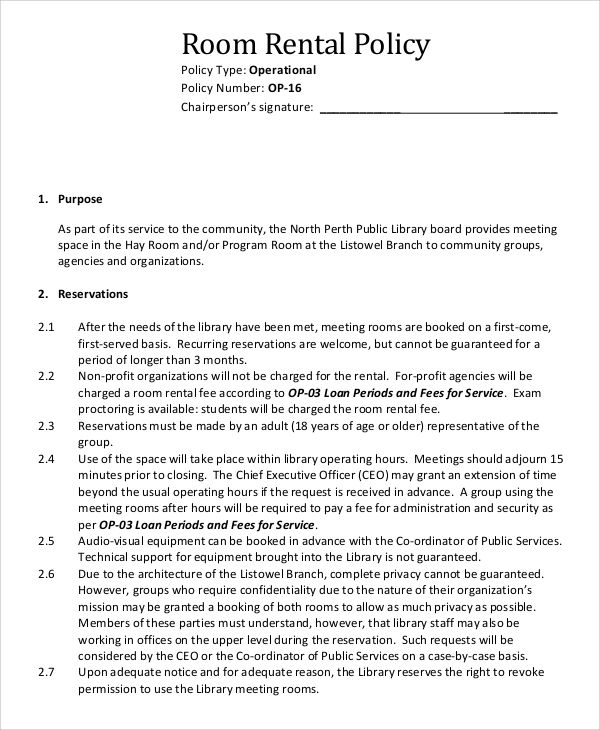 You may also see the Sample Room Rental Agreements. What details are included in these Agreements? The duration of the Rental Agreement and the payment details are of utmost importance. These are included, along with the personal details and contact information of the concerned parties. In this document, all the terms related to keeping of pets and entertaining the visitors are clarified. It also includes the details of security deposits, clauses related to property damage and other personal agreements between the parties. There may be other codes of security and healthiness, and the two parties sign upon these clauses for mutual benefit. In case there are obligations for repair and maintenance works, they are clarified in the agreement. 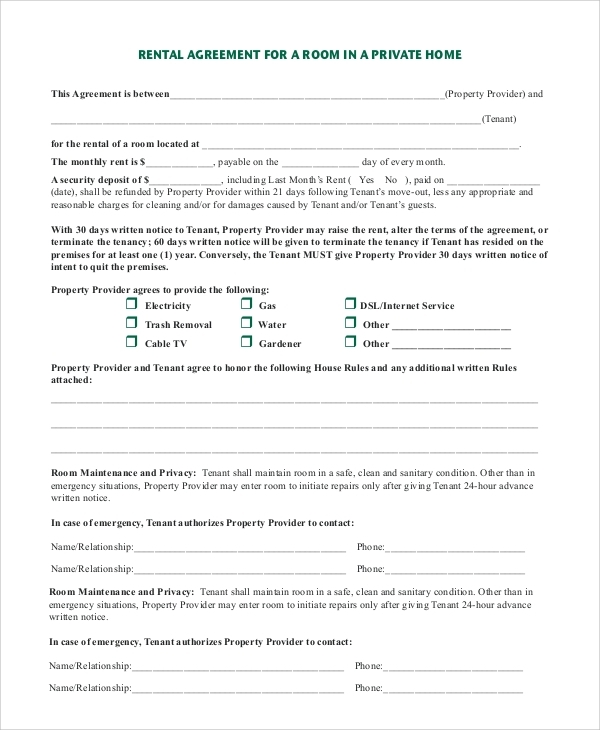 If you are a tenant or the owner of property, you need to customize the Rental Agreement Forms as per your requirement. You can browse the website for different formats of Rental Lease Agreements and tailor the ones that you are comfortable with. This will ensure full security to your agreement with the other party.